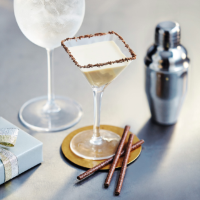 A fabulous cocktail for those who also enjoy their chocolate! Shake all the ingredients together, except the garnish. Strain twice into chocolate-rimmed glasses over crushed ice. Serve with Matchmakers. This recipe was first published in Fri Dec 09 13:50:50 GMT 2016.